WICHITA, Kan. (AP) – A judge has sentenced an anti-abortion zealot convicted of murdering a prominent Kansas abortion doctor to life in prison with the possibility of parole after 50 years. 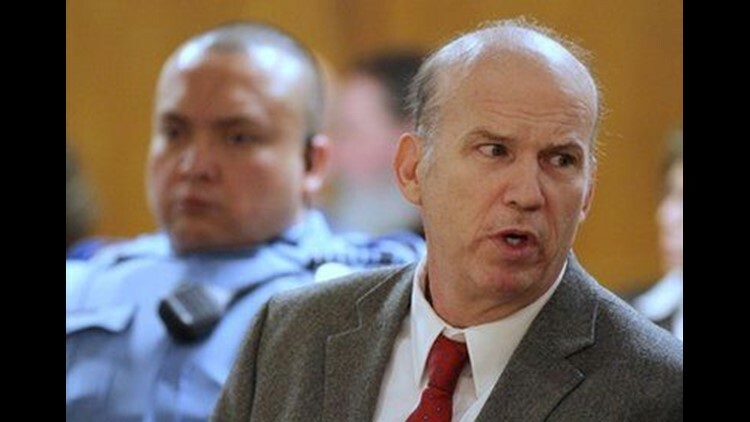 Scott Roeder faced a mandatory life prison term for gunning down Dr. George Tiller in the back of Tiller's Wichita church last May. Sedgwick County District Judge Warren Wilbert could have made the 52-year-old Roeder eligible for parole after 25 or 50 years. He gave him the harsher sentence because he said the evidence showed Roeder stalked Tiller before killing him. Roeder testified that he killed Tiller because he felt doing so would protect unborn children. WICHITA, Kan. (AP) — A man who murdered one of the few U.S. doctors who performed late-term abortions lashed out at the court during his sentencing hearing Thursday and took the opportunity to describe abortion procedures in detail, which he was previously forbidden from doing during the trial. Scott Roeder, 52, accused Sedgwick County District Judge Warren Wilbert of "duplicity" and said his trial was a miscarriage of justice because he wasn't allowed to present testimony about the evils of abortion. He said the deaths of a few providers like Dr. George Tiller must be weighed against the millions of abortions that have been performed. "I stopped him so he could not dismember another innocent baby," Roeder said. "Wichita is a far safer place for unborn babies without George Tiller." Roeder has admitted gunning down Tiller in the back of Tiller's Wichita church last May. He faces a mandatory life prison sentence, and Wilbert must decide whether to make him eligible for parole after 25 or 50 years. The judge indicated during the hearing that there appeared to be enough evidence to qualify Roeder for the harsher of the two sentences. Roeder was barred from describing abortion procedures during the testimony portion of his trial. Abortion is legal in Kansas, and prosecutors were careful not turn the trial into a referendum on abortion. On Thursday, Roeder told the court that Tiller "dismembered living children with the nod of approval from the state." He said God's judgment against the U.S. will "sweep over this land like a prairie wind." "He will avenge every drop of innocent blood," Roeder said. Earlier Thursday, Lee Thompson, who was Tiller's friend and attorney and still represents the Tiller family, asked Wilbert to give Roeder the harshest sentence possible, saying anything less would encourage other anti-abortion fanatics to follow in Roeder's footsteps. "It will happen again and again," Thompson said. "This is domestic terrorism. This act will be repeated by this person if he ever sees the light of day again." Thompson described Tiller as a devoted husband, father and grandfather and a strong believer in women's rights. He said his office still receives calls from women seeking medical services. As he spoke, Tiller's widow Jeanne cried. Roeder at times looked away, yawned and took a drink of water. "The impact of his death on women throughout the world is like an earthquake," Thompson said. "They ask, where can I go? What will I do?' I have to say, 'I'm sorry, I can't tell you.' That's the impact of this crime." Prosecutors seeking the harsher sentence must show an aggravating circumstance, such as whether Roeder stalked his victim before killing him. Sedgwick County District Attorney Nola Foulston argued that the longer sentence was warranted because Roeder stalked Tiller for years, and he put others at the church in danger when he shot the doctor and when others chased him afterward. Roeder testified in January that he had previously taken a gun into the doctor's church and had checked out the gated subdivision where Tiller lived and the clinic where he practiced. Foulston said the murder hurt Tiller's church and "wounded the country." Thompson said Roeder targeted Tiller in a "hate crime" because Tiller provided abortion services. Security was tight for the hearing. Law enforcement officers had explosive-detecting dogs sniffing reporters' equipment before the hearing. Four Sedgwick County sheriff's deputies were on duty outside the courtroom Thursday, along with several agents from both the FBI and the Bureau of Alcohol, Tobacco, Firearms and Explosives. Although he could spend the rest of his life in prison, Roeder may have gotten what he wanted all along: In the months since Tiller's death and his clinic was closed, it has been markedly more difficult to get an abortion in Kansas. The state was left with no facility where women can have the late-term procedure. Just three clinics in the state — all located in or near the Kansas City area — offer limited abortion services for women up to their 21st week of pregnancy. An early vow by one of Tiller's contemporaries to fill the gap hasn't materialized, and state lawmakers are moving to enact tough new rules to dissuade other doctors from taking Tiller's place. But outside Kansas, abortion-rights supporters say there's been a surge in late-term abortion practices by doctors emboldened to pick up where Tiller left off. "What he really did was murder a doctor in church, and the effect on abortion is negligible," said Dr. LeRoy Carhart, a Nebraska doctor who worked part-time for Tiller and said he hasn't given up on the idea of opening a practice in Kansas where late-term abortions would be performed. Associated Press Writer John Hanna in Topeka contributed to this report.